Background BRCA1- and BRCA2-associated tumors appear to have distinct molecular signatures. BRCA1-associated tumors are predominantly basal-like cancers, whereas BRCA2-associated tumors have a predominant luminal-like phenotype. These two molecular signatures reflect in part the two cell types found in the terminal duct lobular unit of the breast. To elucidate novel genes involved in these two spectra of breast tumorigenesis we performed global gene expression analysis on breast tumors from germline BRCA1 and BRCA2 mutation carriers. Methodology Breast tumor RNAs from 7 BRCA1 and 6 BRCA2 mutation carriers were profiled using UHN human 19K cDNA microarrays. Supervised univariate analyses were conducted to identify genes differentially expressed between BRCA1 and BRCA2-associated tumors. Selected discriminatory genes were validated using real time reverse transcription polymerase chain reaction in the tumor RNAs, and/or by immunohistochemistry (IHC) or by in situ hybridization (ISH) on tissue microarrays (TMAs) containing an independent set of 58 BRCA1 and 64 BRCA2-associated tumors. Results Genes more highly expressed in BRCA1-associated tumors included stathmin, osteopontin, TGFβ2 and Jagged 1 in addition to genes previously identified as characteristic of basal-like breast cancers. BRCA2-associated cancers were characterized by the higher relative expression of FGF1 and FGFR2. FGFR2 protein was also more highly expressed in BRCA2-associated cancers (P = 0.004). Significance BRCA1-associated tumours demonstrated increased expression of component genes of the Notch and TGFβ pathways whereas the higher expression of FGFR2 and FGF1 in BRCA2-associated cancers suggests the existence of an autocrine stimulatory loop. The online version of this article (doi: 10.1007/s10549-008-0087-1) contains supplementary material, which is available to authorized users. BRCA1- and BRCA2-associated tumors have many morphologic features in common. These include ductal histology, high histologic grade, pushing tumor margins and a notable host lymphocytic response [1, 2]. 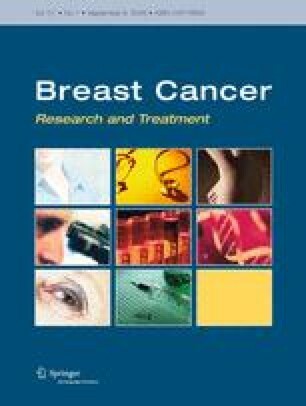 Despite these similarities they have distinct molecular signatures; BRCA1-associated tumors have been shown to be predominantly estrogen receptor negative and to have a basal phenotype [3, 4, 5], whereas we have shown previously that BRCA2-associated tumors have a luminal phenotype characterized by the expression of estrogen receptor and luminal-type cytokeratins . These two molecular signatures reflect in part the two cell types, basal/myoepithelial and luminal found in the terminal duct lobular unit of the normal breast. Basal-like human breast cancers have been shown to exhibit aberrations in the epidermal growth factor receptor (EGFR) signaling pathway . With the exception of Cyclin D1, genes responsible for promoting the growth and survival of BRCA2-associated cancers have yet to be identified . Our objective in performing global gene expression analysis on BRCA1- and BRCA2-associated tumors was to distinguish these distinct pathways of carcinogenesis and to elucidate novel genes necessary for the transformation and survival of BRCA2-associated tumors. Flash frozen tumor tissue was available from 7 germline BRCA1 carriers and 6 germline BRCA2 carriers participating in the Ontario Familial Breast Cancer Registry (OFBCR) [8, 9] and the Ontario Cancer Genetics Network (OCGN). Following pathologic confirmation of invasive disease, the tumor tissue was frozen and stored in liquid nitrogen. Testing for germline mutations in BRCA1 and BRCA2 was performed using an RNA/DNA-based protein truncation test with complementary 5′ sequencing as previously described . All mutations were confirmed by DNA sequencing. Mutations were classified as deleterious if they were protein-truncating, missense mutations (rare), or splice-site mutations as defined by the Breast Informatics Consortium (http://research.nhgri.nih.gov/bic/). The clinicopathologic characteristics and mutation status (for the BRCA1-associated and BRCA2-associated tumors) are summarized in Table 1. Tumors were classified according to the WHO histologic classification of breast tumors  and graded by central pathology review using the Nottingham histologic grading system . The pathologist was blinded to the mutational status or family history of the participants. Receptor status was obtained by either biochemical or immunohistochemical methods. A validation set of formalin-fixed paraffin-embedded (FFPE) tumors from 58 BRCA1 carriers, 64 BRCA2 carriers and 242 additional individuals from the OFBCR without BRCA1 or BRCA2 mutations was used to construct tissue microarrays (TMAs). Total RNA was isolated from 20 to 50 mg of tumor tissue using TRIzol reagent (Gibco BRL Life Technologies). Reference RNA was a pool of 13 cell lines, modified from the common reference cell line list . Tumor and reference RNAs (5 μg) were reverse transcribed with Superscript III reverse transcriptase (Invitrogen) to yield cDNA. Tumor and reference cDNA (5 μg) were indirectly labeled using aminoallyl nucleotide analogs with Cy3 and Cy5 fluorescent tags, respectively. The labeled probes were simultaneously hybridized to UHN human 19K cDNA microarray slides (www.microarrays.ca), and incubated overnight at 42°C. These 19K cDNA microarrays are single-spotted and contain 19,008 characterized or unknown human expressed sequence tags (ESTs). The clone set has been sequence-verified at the UHN Microarray Centre, Toronto. Following hybridization the slides were washed and scanned using an Axon scanner. Fluorescent dye swap experiments were also performed for two tumors. The gene expression data were obtained from the original image files as spot intensities by correcting the mean foreground for each spot with the median local background. The array quality was controlled by requiring arrays to have more than 80% of spots with spot intensities higher than their local background and more than 75% of spots with spot intensity higher than 1.2 times their local background in both channels . Spots with foreground intensity lower than background were treated as missing. A relative expression value was obtained for each gene as the log base 2 ratio of the adjusted intensity for the sample channel versus the reference channel. The log2 ratios were normalized by a within-subarray print-tip “loess” adjustment, followed by a between-array scale adjustment . Poor quality spots as flagged by the GenePix image analysis software were excluded from the normalization. Pre-processing and normalization were carried out using the R-Bioconductor package LIMMA ; http://www.Bioconductor.org). There were 18,981 genes retained in the final data set for analysis. mRNA expression levels of six selected genes that were statistically significantly differentially expressed between the two tumor groups and/or of biologic interest were measured in representative tumor specimens by real-time reverse transcription-polymerase chain reaction (RT-PCR) using TaqMan® PRISM 7500 Fast Real-Time PCR System (Applied Biosystems, Foster City, CA). Gene expression levels were determined by quantification relative to a control gene, hypoxanthine guanine phosphorbosyl transferase (HPRT). cDNA was generated using the ABI High Capacity cDNA Archiving Kit (Applied Biosystems, Foster City, CA) and RT-PCR reactions were carried out following the manufacturer’s protocol. Tissue microarrays were constructed as previously described  using FFPE tumors from 58 BRCA1 carriers, 64 BRCA2 carriers and 242 individuals without BRCA1 or BRCA2 mutations from the OFBCR. 4 μm thick sections of these blocks were used for immunohistochemical staining with the FGFR2 antibody (polyclonal, Abcam). 5 μm thick sections were used for mRNA in situ hybridization (ISH). ISH analysis of breast cancer has been reported in detail elsewhere previously . Briefly, a cDNA probe for ISH was made to the gene of interest using 33P-UTP-radiolabeled cRNA. Using routine techniques the TMA sections were hybridized with the radiolabeled antisense probe, washed, and treated with Kodak NBT-2 nuclear emulsion. The sections from the TMAs were stored at 4°C for several weeks prior to development in Kodak D-19 solution; they were subsequently fixed in Kodafix and counterstained with 0.1% toludine blue. Immunoreactivity and mRNA ISH was scored using the Allred method , which combined the intensity of staining with the percentage of positive tumor cells observable resulting in a combined score of 0–8. For FGFR2, a score of 7 or above was considered positive; for Jagged 1, a previously determined score of 4 or higher  was considered positive. To identify genes that discriminate between BRCA1- and BRCA2-associated tumors, supervised univariate analyses of array-based log2 gene expression were performed for each clone treating the modified Student t-test as the primary analysis  using the SAM procedure implemented in open source software, version 2.1.0 (http://www.r-project.org/). To assess the sensitivity of the results to this analysis method the random variance test was also applied using BRB ArrayTools (http://linus.nci.nih.gov/BRB-ArrayTools.html). For each test, all clones were ranked according to their ability to discriminate BRCA1-associated tumors from BRCA2-associated tumors. Supplementary Table 1 reports discriminating genes with P-values ≤ 0.01 according to the modified Student t-test. P-values were not adjusted for multiple testing. Log2 transformed relative expression of genes validated by RT-PCR was compared to array-based log2 gene expression via scatter plots. Means of the RT-PCR expressions were compared between the two BRCA tumor groups using the Student’s t-test and Welch unequal variance t-tests. All tests were two-sided. P-values were not adjusted for multiple testing. 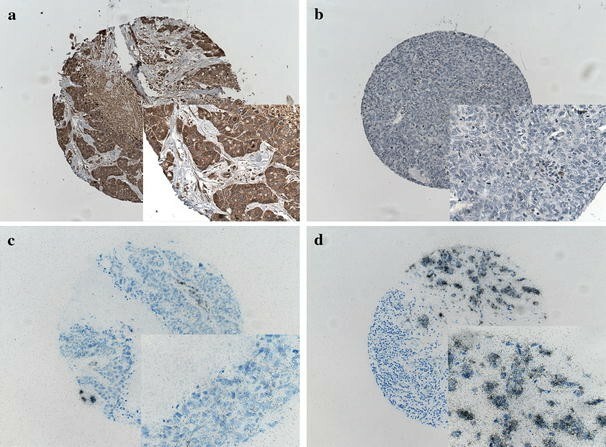 The proportion of tumors positive by immunohistochemical staining and mRNA ISH for BRCA1-associated and BRCA2-associated tumors were compared using Fisher’s exact test for association. All tests were two sided. Statistical analysis was performed using SAS 9.1 software (SAS, Institute Inc., Cary, North Carolina). P-values were not adjusted for multiple testing. Thirteen tumors were obtained from individuals known to harbor a BRCA1 or BRCA2 germline mutation. As indicated in Table 1, all of the 13 BRCA-associated tumors were grade III/III invasive ductal, no special type tumors (NST). Both ER positive/equivalent and negative tumors were included among the BRCA1 and BRCA2 carriers. The mean age at diagnosis of the BRCA1 patients was somewhat younger than the mean age for the BRCA2 subjects (38 vs. 43 years). The modified Student t-test was used to identify clones on the arrays that were differentially expressed between the BRCA1- and BRCA2-associated breast tumors. There were 4 distinguishing clones with a P-value < 0.001 and 127 clones with a P-value < 0.01. The 150 top-ranked differentially expressed genes with a P-value of ≤0.01 are listed in supplementary Table 1 and displayed as a heat map, Fig. 1. BRCA1-associated tumors were characterized by the higher relative expression of 52 of these clones. Using the gene ontology database (NCBI), these genes was predicted to be involved in diverse cellular functions such as proliferation, angiogenesis, cell motility, cell adhesion, transcription and DNA repair. Involvement in the MAPK, Wnt, EGFR and TGFβ signaling pathways was identified. BRCA1-associated differentially expressed genes included stathmin/oncoprotein 18 (P = 0.0002), osteopontin (P = 0.002) and TGFβ2 (0.011). BRCA2-associated tumors preferentially expressed 98 of the 150 clones. These genes were found to have functions related to transcription, signal transduction, cell proliferation, cell adhesion and extracellular matrix remodeling. Involvement in the MAPK signaling pathway was common. BRCA2-associated cancers were characterized by the higher relative expression of FGF1 (P = 0.003) and FGFR2 (P = 0.004). To confirm the differences in gene expression, quantitative real-time RT-PCR was performed for several genes including FGF1, FGFR2, stathmin/oncoprotein 18, osteopontin and TGFβ2. Due to limited amounts of RNA, only 5 BRCA1- and 6 BRCA2-associated tumor RNAs were available for RT-PCR. Similar to the microarray data, the levels of expression of osteopontin and TGFβ2 were significantly higher in the BRCA1-associated tumors compared to the BRCA2-associated tumors (P = 0.03 and 0.001, respectively, Fig. 2). BRCA2-associated tumors expressed higher levels of FGF1 compared to BRCA1-associated tumors and BRCA1-associated tumors had higher levels of stathmin/oncoprotein 18 compare to BRCA2-associate tumors, similar to the microarray data; but these differences however, did not reach statistical significance at the 5% level (P = 0.76 and P = 0.28 respectively, data not shown). Because the levels of FGFR2 were too low to quantitate reliably in the tumors using real time RT-PCR we used immunohistochemistry (IHC) to determine the level of expression of FGFR2 in an independent set of tumors. Tissue microarrays were constructed from FFPE tumors from 64 BRCA2 carriers, 58 BRCA1 carriers and 242 individuals without BRCA1 or BRCA2 mutations. A total of 19 out of 64 (30%) BRCA2-associated tumors stained positive for FGFR2 compared to 3 of 50 (6%) of BRCA1-associated tumors (P = 0.004, Fig. 3). Furthermore, 25 of 151 (17%) breast tumors from non-mutation carriers were positive for FGFR2, yielding statistically significant differences among the three tumor groups (P = 0.0007). Further analysis of all tumor groups suggested that FGFR2 expression was inversely correlated with the basal phenotype (as defined by the absence of ER, PR and HER2 expression and the presence of CK 5 or EGFR expression), with 9 of 65 (13%) basal-like tumors staining positively for FGFR2 expression compared with 36 of 136 (27%) non-basal-like breast cancers (P = 0.2). More specifically, FGFR2 negative tumors were more likely to be ER negative than FGFR2 positive tumors (49.8 vs. 26.7%, P = 0.004, Table 2). Similarly FGFR2 negative tumors were more likely to be negative for the luminal cytokeratin CK8/18 and p27 (14.9 vs. 2.2%, P = 0.02 and 36.8 vs. 13.8%, P = 0.01 respectively, Table 2) and more likely to be positive for the basal cytokeratin CK 5 and vimentin (32.0 vs. 19.2%, P = 0.08 and 20.3 vs. 5.9%, P = 0.04 respectively, Table 2). FGFR2 expression was also positively associated with PR expression (P = 0.01, Table 2). Since BRCA1-associated tumors cluster with basal-like cancers [5, 6, 20], we evaluated whether genes previously found to be more highly expressed in basal-like tumors were differentially expressed in the BRCA1 compared to the BRCA2 groups. Microarray based values of keratin 17, vimentin and caveolin1 tended to be higher in BRCA1-associated tumors; however, the differences in expression of these genes (P = 0.095, 0.067, and 0.233, respectively) did not meet our global selection cut-off. Recently we have found that basal-like tumors tend to exhibit higher expression of Jagged 1 , a ligand involved in Notch pathway signaling. The Notch pathway has been shown to regulate a number of processes important in cancer including angiogenesis , epithelial to mesenchymal transition, and stem-cell like characteristics . Using RT-PCR we found that the mean expression level of Jagged 1 tended to be elevated in BRCA1-compared to BRCA2-associated tumors (2.07 versus 0.50, P = 0.11). Because only 11 tumors were available for RT-PCR, we examined the expression of Jagged 1 by mRNA ISH on the TMAs. Of 48 BRCA1-associated tumors, 17 (35%) were positive for Jagged1 by ISH compared to 5 of 53 (9%) BRCA2-associated cancers (P = 0.02, Fig. 3). In recent years, gene expression profiling of breast cancers has improved our understanding of the heterogeneity of the disease and generated hypotheses concerning the development and progression of these cancers. Molecular signatures for BRCA1-associated tumors have been delineated, but BRCA2-associated tumors have been less well studied [5, 7]. To elucidate novel genes involved in the development and progression of BRCA2-associated tumors and to distinguish distinct pathways of carcinogenesis in BRCA1 and BRCA2-associated tumors, we compared gene expression microarray patterns in tumors from BRCA1 and BRCA2 carriers. We found that FGFR2 and FGF1 were more highly expressed in BRCA2-associated cancers as compared to BRCA1-associated breast cancers, suggesting the presence of an autocrine growth stimulatory loop. FGF1 and FGFR2 belong to a large family of ligands and receptor tyrosine kinases . FGF1 is a mitogen that signals through FGFRs and subsequently activates the MAPK signaling cascade. Overexpression of FGF1 in breast cancer cell lines has been shown to result in increased anchorage independent growth and reduced requirement for estrogen in vitro and to increased tumorigenicity, angiogenesis and metastatic behaviour in vivo [25, 26]. FGF1 is located at 5q31 a region of the genome often subject to loss in BRCA1-associated cancers  and basal-like cancers . FGFR2, located at 10q26, encodes at least two receptor isoforms FGFR2-IIIb and FGFR2-IIIc. FGFR2-IIIc is mainly expressed in tissues of mesenchymal origin, whereas FGFR2-IIIb is expressed in the epithelium of many organs including the mammary gland [29, 30]. The FGFRs in general and FGFR2 specifically have roles in embryogenesis, development and carcinogenesis. FGFR2 mRNA is expressed in many carcinoma cell lines [31, 32, 33] and in the breast cancer cell lines examined, FGFR2 expression contributes to their invasive phenotype. Similarly, overexpression of the receptor in normal human mammary epithelial (HME) cells leads to their transformation . These properties are attributable to the activation of the mitogen-activated protein kinase (MAPK) and phosphatidylinositol 3-kinase (PI3K) signaling cascades . Moreover, the gene locus (10q26) is amplified in 2–10% of breast cancers and its expression has been reported in 50–100% of human breast cancers, with high-level expression confined to 4%–12% of cases [35, 36]. It has also been associated with estrogen (ER) and progesterone (PR) receptor expression and improved overall and disease free survival . Moreover in two recent independent genome wide association studies (GWAS) single nucleotide polymorphisms (SNPs) within intron 2 of FGFR2 have been causally associated with increased risk of both familial and sporadic breast cancer [37, 38]. Furthermore this susceptibility locus was associated with younger age of onset and bilateral disease . The authors speculate that the SNPs have functional effects and that the association with breast cancer risk is mediated through regulation of FGFR2 expression possibly through interaction with the ER. In our study we have shown that FGFR2 expression is positively associated with the BRCA2 genotype, a tumor group that we have previously shown to be predominantly ER-positive luminal-type tumors . In addition, we found that FGFR2 expression was positively associated with PR expression, a weak prognostic and predictive factor in breast cancer and often regarded as indicative of a functional ER pathway . Conversely, FGFR2 expression was negatively correlated with basal-like breast cancers which are known to be ER negative and to carry an adverse prognosis [5, 6]. Our expression studies support previous reports indicating that BRCA1-associated breast cancers have a basal-like profile [3, 5]. In the BRCA1-associated tumor group, we detected elevated expression of a number of genes, including keratin 17 [5, 6], vimentin, and caveolin 1 , that have previously been linked to the basal-like cancers. Our results also suggest that Y-box binding protein-1 is more highly expressed in BRCA1-associated breast cancers (P = 0.001). This protein has recently been demonstrated to transcriptionally induce EGFR which is commonly overexpressed in basal-like cancers . In addition we found that stathmin/oncoprotein 18 and osteopontin were overexpressed in BRCA1-associated tumors relative to BRCA2-associated tumors. The gene for stathmin, located at 1p36, is one of the 70 genes that compose the ‘70 gene classifier’ that predicts poor prognosis in sporadic breast cancer  a classifier that correlates closely with the poor performing subgroups from the intrinsic gene set of which basal-like cancers are one . Stathmin is a microtubule depolymerizing protein involved in cell cycle progression and cell motility. It is highly expressed in a number of human malignancies, including breast cancers where it is negatively correlated with ER expression and positively correlated with grade, aneuploidy, proliferation and mutant p53 , all characteristic features of BRCA1-associated and basal-like cancers [3, 5, 6]. Osteopontin, a secreted phosphoprotein, has been shown to interact with a diverse range of factors including integrins, CD44, TGFα, EGFR, Met and VEGF leading to the enhancement of cellular migration, invasion, survival and angiogenesis. [44, 45, 46]. Osteopontin is expressed in a wide variety of human malignancies and its expression has been reported to be correlated with poor prognosis in breast cancer . Novel results from our expression study include the identification of members of the Notch and TGFβ signaling pathways, Jagged 1 and TGFβ2 respectively, as being more highly expressed in BRCA1-associated tumors. Both of these pathways are highly conserved through evolution and play important roles in development, differentiation and tumorigenesis [48, 49]. Moreover, both pathways are known to play a role in mammary stem cell maintenance or renewal [50, 51]. Dontu et al. have shown that Notch signaling can act on mammary stem cells to promote self-renewal, on early progenitor cells to promote proliferation, and on multipotent progenitor cells, facilitating myoepithelial cell lineage specific commitment and proliferation . Furthermore, patients whose breast cancers express Jagged 1 have been found to have a poorer prognosis . Shipitsin and colleagues showed that TGFβ signaling is upregulated in normal breast stem cells and their malignant counterparts and has prognostic effects . In conclusion, our molecular profiling demonstrates that BRCA1-associated and BRCA2-associated tumors have distinct molecular profiles. Our results confirm the known link between BRCA1-associated tumors and the basal-like signature and highlight a link between the Notch and TGFβ pathways and BRCA1-associated tumorigenesis. In contrast the data suggest that BRCA2-associated tumors express higher levels of FGFR2 and FGF1, suggesting the existence of an autocrine loop leading to downstream pleiotrophic cellular effects. The authors thank Dr. Brendan Dickson and Hui Zhang for their technical assistance. Grant numbers and sources of support: This work was supported by the Canadian Breast Cancer Foundation and the National Cancer Institute under RFA #CA-95-003 as part of the Breast Cancer Family Registry (BreastCFR).